A man who was questioned by Miami-Dade Police in connection to the murder investigation of a teen whose body was found at a construction site was released early Wednesday. Police said their investigation is far from over, however. "We've certainly not ruled him out as a suspect still," Miami-Dade Police spokesman Det. Roy Rutland said Wednesday night of Miguel Infante, 34. Infante said he was questioned for hours in the death of 18-year-old Tiffany Cabreja, whose body was found in the area of Southwest 288th Street and 144th Avenue on Saturday. A man who said he was questioned by Miami-Dade Police in connection to the murder investigation of a teen whose body was found at a construction site was released early Wednesday. Miguel Infante and his girlfriend Raquel Delgado, who was also questioned, spoke about the case of 18-year-old Tiffany Cabreja. Infante said he didn’t kill anyone. "All they've been doing was forcing me to say something. I have been trying to give them the true answer. I did not kill no one. I did not drop no body down. That's all I can tell you," Infante said. Infante said he drives a landscaping truck, and said police were using that to connect him to the crime. Infante's girlfriend, 35-year-old Rachel Delgado, said she was also questioned by police. "How can they say that they saw him if we never even made a stop?" Delgado said. "And we're gonna be looking at us like we're killers, we're not killers, we're normal human beings that would never take anybody's life." Both said they don't know Cabreja but hope her killer is found. 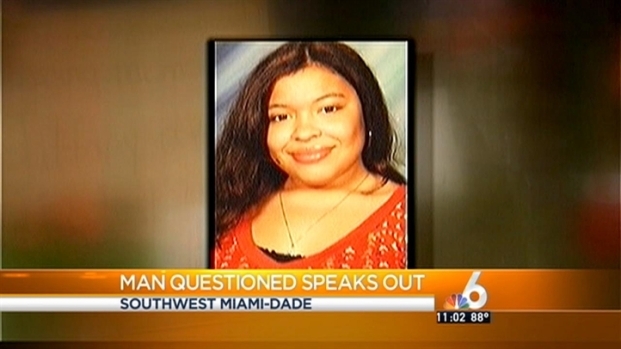 Miguel Infante says he was questioned by Miami-Dade Police in the death of Tiffany Cabreja but claims he's innocent. On Tuesday, police said they'd taken a man into custody in connection for questioning but they didn't identify him. A man who said he was questioned in the death of 18-year-old Tiffany Cabreja is released by MIami-Dade POlice after hours of questioning. Rachel Delgado, girlfriend of Miguel Infante, says they would never kill anyone. Infante and Delgado said they were in their truck and were having an argument when Delgado fell out of the truck. They said she got back in and they left. She said she has road rash that proves it. Witnesses reported seeing a toddler in the truck. Police said Tuesday that the toddler was located and is safe and with family. Delgado said the toddler was her young daughter who was in the truck during the argument. Infante said that after he put Delgado in the truck, he took her and the toddler riding in the truck home. "I want this to be over with," Infante said, "so they can find the real killer." Cabreja's father said he doesn't believe the story from Delgado and Infante. "I don't buy that story," Domingo Cabreja said Wednesday. "He has to know what happened." Infante later went to the scene of where Cabreja's body was left and gave his condolences to the family. "I'm an innocent man, I don't know what happened, I'm so sorry for your loss," Infante said. "I just hope everything, they catch this man." Police's forensic investigation continues. Meanwhile, in an attempt to be a voice for Cabreja, Miami-Dade Police are asking for the public’s help in trying to fill a 12-hour time gap between Saturday at 8 p.m. and the next morning when her body was found. Anyone with information on the case is asked to call Miami-Dade Crime Stoppers at 305-471-TIPS.